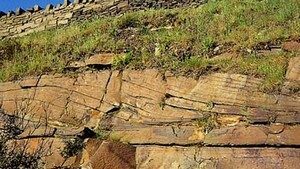 Sedimentary rocks are usually bedded, which means they are in definite layers (beds) of a single rock type with a break above and below called a bedding plane. 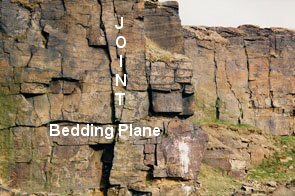 Each bed of sandstone was probably laid down within a fairly short period of time and the bedding plane represents an interval when deposition ceased. Graded bedding at MethleySome sandstones have massive bedding, with beds that can be several metres thick. These massive beds probably developed in a river channel where sediment was laid down from a fast flowing current carrying a large volume of suspended sediment. These currents then experienced a rapid decrease in velocity and the suspended load dropped suddenly. This rapid deposition is also characteristic of a further type of massive bed which develops at the edge of the delta front where sediment avalanches down to the basin floor. 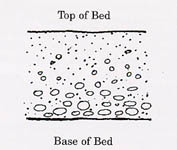 Sketch of graded bedding The speed of this action gives no time for internal layering to occur, although a sorting of grain sizes (known as graded bedding) develops from the suspended load. 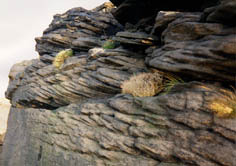 Many of the Millstone Grit sandstones have preserved within them a series of low angled beds and bedding planes known as cross-bedding. These beds formed as sandbanks on the inside bend of a meandering river channel where water velocity was lower and finer sediment was deposited. Cross bedding at Pule Hill QuarryIt is clear from the scale of the cross bedding that some channels were 0.5 to 1km wide and up to 40m deep, similar to the present deltas of the Indus in Pakistan and Brahmaputra-Ganges in Bangladesh. For more information see our Environments of Deposition, section. Flaggy bedding has bedding-planes about 2 to 5 cm apart and was formed in calmer conditions in shallow waters in the delta, where there was a regular slow supply of sediment deposited at intervals. These beds are ideal for use as flagstones for paving and ‘slates’ for roofs. For more information about the Rocks and Landscapes of Huddersfield see our other pages on Local Geology and our guide to the Geology of Huddersfield.